Our Focus: Supplements. Yoga. Health. Unleash your body’s full potential and vigor with the help of Yogi Life. Take advantage of our dietary supplements and get the extra boost you need to up your performance and overall health. Our Yogi Life supplement line has been designed specifically for yoga practitioners and anyone living an active health and wellness lifestyle. Our supplements will help you feel incredible and will assist in preparing your mind and body for every type of yoga class you wish to take. In general, a yogi prefers a gluten-free, vegetarian, or vegan option when it comes to food and supplements, which Yogi Life supplements offer. The majority of yogis also use Ayurvedic herbs and spices as medicine, so of course, we provide Ayurvedic supplements as well. Yogi Life supplements are the right choice for yoga practitioners. For centuries, humans have found relaxing benefits in drinking green tea. L-Theanine is an amino acid found naturally occurring in the green tea plant (Camellia sinensis). It is made in both the leaves and the root of the green tea plant. Of all the amino acids in green tea, L-Theanine makes up fifty percent. Interestingly, the amino acid occurs in its free form in the leaves and is not bound to proteins. Many use it for easing tension and calming their mood. Recent research has shown a myriad of benefits to our brain’s ability to both—paradoxically—be more alert and relaxed. L-Theanine seems to stimulate alpha waves in the brain. Alpha waves have been shown to play an important role in attention and alertness. Others find benefit in using L-Theanine during sports activities that require focus. B-vitamins help boosts the processes the body uses to make energy from the food we eat. They also help form red blood cells. You can get B-vitamins from a variety of food, such as fish, poultry, meat, eggs, and dairy products. Leafy green vegetables, beans, and peas also have B-vitamins, and many kinds of cereal and some bread are fortified with them. Because B-vitamins are only stored in small quantities, they must be replenished each day through the diet. Ashwagandha, commonly known as “Indian winter cherry” or “Indian Ginseng” is an Ayurvedic herb native to the dry regions of India, Northern Africa, and the Middle East. The name Ashwagandha comes from the translation "smell of horse", which is said to be due to the roots ability to give you the strength and vigor of a horse, and for the root itself smelling like a horse ("ashwa"). Ashwagandha is an important herb used as a Rasyana or something that promotes health and longevity. This herb is a general tonic used to support a healthy stress response, provide energy support, as well as energize and rejuvenate the adrenal and thyroid glands, as well as the male and female reproductive system. Ashwagandha, with its glycowithanolide bioactives, has been found to have potent antioxidant properties, which can provide immune system support, as well as provide neuroprotective and mental cognition support. Ginger (Zingiber officinale) has a long history of use in promoting healthy digestion, as well as aiding in nausea and morning sickness. It has also been shown to support healthy joints and the soft tissue healing process. This product contains supercritical ginger extract and whole ginger powder to provide a full-spectrum botanical with all the traditional benefits of ginger. Since botanical powders may be difficult to digest due to the cellulose fiber naturally found in plants (humans aren't able to digest cellulose), cellulose is added to the formula. Cellulase is a natural enzyme that breaks down cellulose, allowing the actives to be released in the body and result in maximum effectiveness. Standardized rosemary extract is added to provide powerful antioxidant protection. Rosemary extract is standardized to 6% carnosic acid, which has been found to be a powerful inhibitor of lipid peroxidation in microsomal and liposomal systems. Researchers have found that rosemary extract is beneficial in maintaining healthy cholesterol levels and in supporting liver health. Inflammation Response – Curcuma longa (turmeric) has a long history of use in Ayurvedic medicine. Curcumin is the active ingredient in turmeric and has been consumed for medicinal purposes for thousands of years. Rosemary (Rosmarinus officinalis) extract contains ursolic acid that supports healthy cell reproduction. Glucosamine is the major building block for the chains and lattices that make up cartilage. By helping to keep these elements in strong supply, glucosamine can help to rebuild cartilage and connective tissue as it is worn down. Until now, all glucosamine has been sourced from shellfish, making it inaccessible to vegetarians and those maintaining a kosher diet. Our Vegetarian Glucosamine comes from an all-natural vegetarian source, making it an effective joint support supplement for everyone. Protein is one of the most important nutrients for maintaining good health; it's a part of every cell in the human body and helps build and maintain connective tissues, bones, blood cells, skin, muscles, organs, and DNA. However, it is not so easy for many of us to obtain proper amounts from our diets. Athletes, pregnant woman, the elderly, young children, and those who eat poorly planned vegan diets are at increased risk for too low protein intake that does not meet daily needs. Research also shows that in the general population diets higher in healthy lean protein help with satiety and weight management. In decades past, supplementing a diet with extra protein was left to the bodybuilders. Today, consumers have begun giving credence to scientific data indicating the importance of high-quality protein in the diet, and the marketplace for all proteins is expanding – particularly for non-soy plant proteins as consumers with food allergies, health concerns, and certain ethical points of view are aware of the potential benefits these types of protein provide. Protein is one of the most important nutrients for maintaining good health; however, it is not so easy for many to obtain proper amounts from their diets. Athletes, pregnant woman, the elderly, young children, and those eating poorly planned vegetarian or vegan diets are at increased risk for too low protein intake. In addition, research shows that in the general population, diets higher in healthy lean protein help with satiety and weight management. In decades past, supplementing a diet with extra protein was left to the bodybuilders. Today, consumers have begun giving credence to scientific data indicating the importance of high-quality protein in the diet, and the marketplace for all proteins is expanding - particularly for non-soy plant-based proteins as consumers with food allergies, health concerns, and certain ethical points of view become aware of the benefits these types of protein provide. With over 60% premium vegetarian protein by weight, pumpkin seed protein is a great way to help vegetarians and vegans meet protein needs.Organic Plant Protein Chocolate has no soy, no gluten, no dairy, and no animal products whatsoever. It’s a 100% vegetarian source that is certified >95% organic. Protein is one of the most important nutrients for maintaining good health; it's a part of every cell in the human body and helps to build and maintain connective tissues, bones, blood cells, skin, muscles, organs, and DNA. However, it is not so easy for many of us to obtain proper amounts from our diets. Athletes, pregnant woman, the elderly, young children, and those who eat poorly planned vegan diets are at increased risk for too low protein intake that does not meet daily needs. Research also shows that in the general population diets higher in healthy lean protein help with satiety and weight management. In decades past, supplementing a diet with extra protein was left to the bodybuilders. Today, consumers have begun giving credence to scientific data indicating the importance of high-quality protein in the diet, and the marketplace for all proteins is expanding – particularly for non-soy plant proteins as consumers with food allergies, health concerns, and certain ethical points of view are aware of the potential benefits these types of protein provide. Magnesium plays a vital role in transmitting electrical impulses from the nerves to the muscles. This action triggers the muscle cell to contract. A magnesium deficiency can disrupt this process and interfere with normal nerve conduction and muscle contraction. L-arginine is a semi-essential amino acid involved in protein synthesis; it can become essential in situations of bodily stress, including intense exercise. It is also a precursor for both nitric oxide and creatine. Nitric oxide from L-arginine acts as a blood vessel dilator and ensures speedy distribution of nutrients like glucose and amino acids to the muscles. L-ornithine & L-citrulline can form L-arginine, which detoxifies ammonia that forms from protein breakdown (via the urea cycle). Removal of ammonia helps lessen feelings of fatigue. L-arginine also has the capacity to promote the secretion of human growth hormone, which is necessary for muscle synthesis. Malate (or malic acid) is an important substrate in the TCA cycle that produces cellular energy in the form of ATP. Altogether, these nutrients can help with muscle performance, recovery, and growth. Suggested Use: Take 6 tablets daily with food. Beets are a great source of dietary nitrate that can be converted to nitric oxide (NO) in the body. Studies show NO from dietary nitrate has a range of beneficial vascular effects, including blood pressure support and enhancing exercise performance. Cocoa, anciently called the “food of gods”, is well recognized for its rich flavonoid and theobromine content. These attributes make cocoa very supportive to the cardiovascular and mental/cognitive systems. Pumpkin seeds are also included which are a natural source of omega fatty acids and vitamins and minerals. Finally, our organic beets are fermented using Lactobacillus acidophilus. Fermented foods provide beneficial probiotics and offer enhanced nutrient bioavailability. 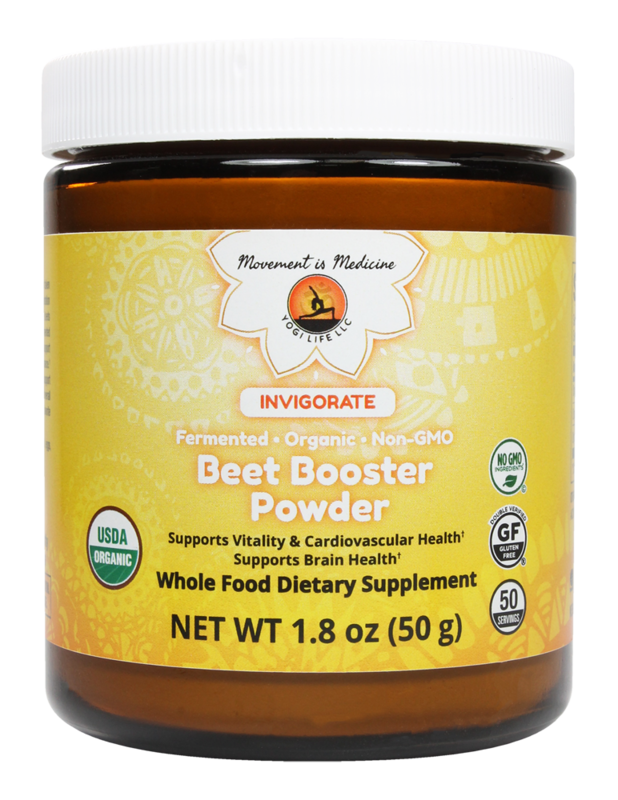 ½ teaspoon provides 800 mg fermented organic beets, 100 mg of organic cocoa, 93 mg of organic pumpkin seed, and 5 mg of Lactobacillus acidophilus. -Great source of antioxidant phytochemicals, vitamins, and mineral from whole foods. 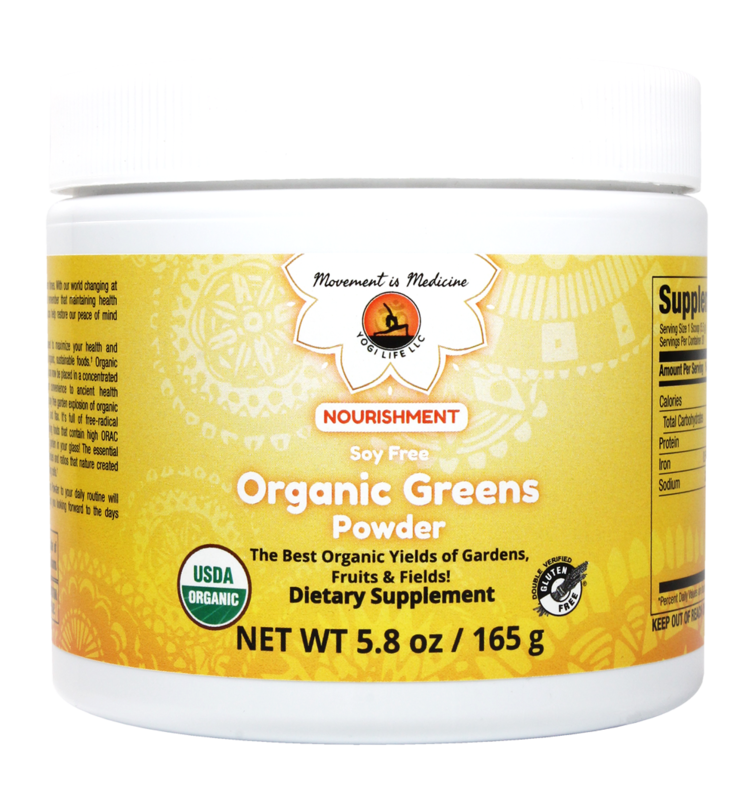 -Contains grasses, fruits, vegetables, seeds, berries, spirulina, and leafy greens. Like all fats, coconut oil is a blend of fatty acids, and contains an unusual blend of both short and medium chain fatty acids. It is this unusual composition that may offer health benefits. Although coconut oil contains 92% saturated fat -- the highest amount of saturated fat in any fat source -- the saturated fat from coconut is mostly in the form of medium chain triglycerides (MCTs), which are metabolized differently than other saturated fats. Coconut oil contains lauric acid, a MCT. Lauric acid makes up about 50% of coconut oil and can inhibit the growth of microbes, such as bacteria, yeast, and fungi. 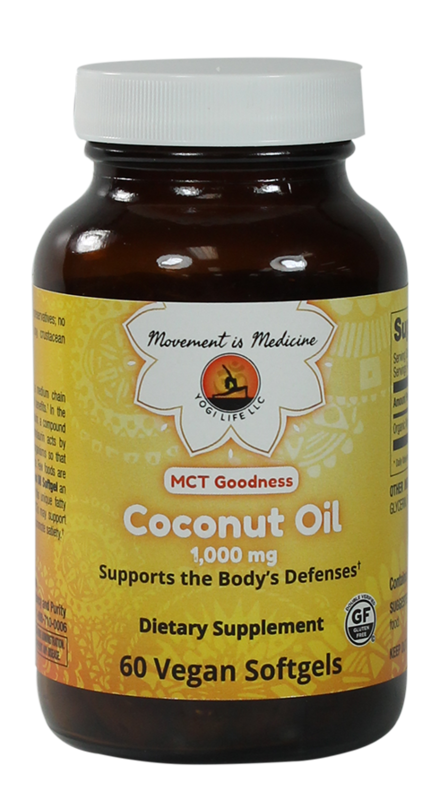 The MCTs in coconut oil also have potential benefits for the brain, heart, and body composition. All sales are final unless the product delivered to you is damaged. Upon the return of the product to Yogi Life, we will send you the same product. Ensure the complete nutrients you need to sustain a healthy and active lifestyle and yoga practice. Switch to using Yogi Life products, and get the added amount of vitamins and nutrients you get from whole foods. We are licensed, registered, and insured supplement retailer for your added safety and peace of mind.